It’s that time of year when many of us reflect over the past year and begin to look forward to whatever the coming year will bring. I’ve always enjoyed reflection – both the looking back kind, as well as the distorted or alternate view of something realistic. Within Málaga’s La Concepción Botanical Gardens lies this Alhambra-inspired pool, which beautifully reflects the nearby pagoda. Even on a hot summer´s day, it´s a pleasure to enjoy the cool green shade and occasional sprinklers of the Gardens, which may catch you by surprise as they irrigate the surrounding plants. 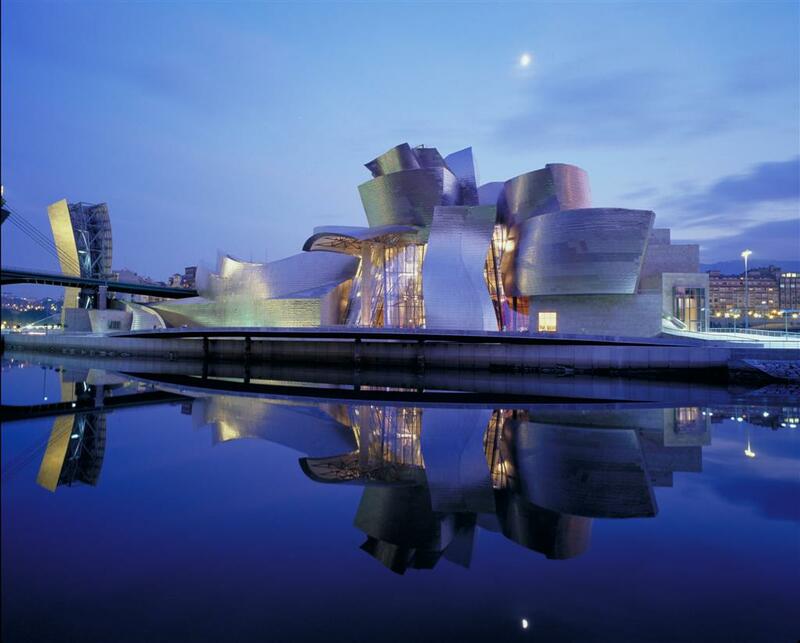 In the Basque Country capital city of Bilbao, in northern Spain, lies the amazing Guggenheim Museum. Located alongside the Nervión River in downtown Bilbao, the museum is a glass and titanium structure resembling a ship, filled with modern and contemporary art. For me though, the exterior was the most impressive, with a series of outdoor exhibits including a giant spider structure, the famous giant puppy monument fashioned out of bedding plants which are renewed each spring, and this huge mirrored bunch of balloons reflecting the pool beyond. I just had to include a photo of one of the spectacular sunsets reflected in my swimming pool. This is a sight I never tire of seeing. Can you make out the tail of the dolphin I had tiled into the floor of the pool (towards the bottom right of the photo)? This was to remind me of the time I swam with dolphins on the Caribbean island of Curacao. Visitors to the eastern Costa del Sol might not anticipate that there is a beautiful Buddhist Stupa within easy reach of the Mediterranean coast. The first Buddhist Kalachakra stupa built in the western hemisphere can be visited about 40 kilometres east of Málaga, just north of the town of Vélez-Málaga. Here you can see the golden dome of the Stupa reflecting the sunlight against an impossibly blue sky. “El Día de los Muertos” or the “Day of the Dead” is a celebration of life held each year throughout Spain on November 1st. Cemeteries are packed with families paying homage to their dead, as family members tend the gravestones of their loved ones by painting, weeding and cleaning them, and by placing fresh flowers and candles. It’s a time of quiet reflection – though I couldn’t help but also notice the blue sky and palm tree reflected in the polished marble of the headstone. In addition to a physical reflection, you might want to explore emotional reflection through an image. Whatever you decide, share a photo that means REFLECTION to you. ** Tom at The Palladian Traveler describes his blog as an ”eclectic site devoted to the pursuit of happiness from within the borders of Italy and, occasionally, beyond.” I particularly enjoyed learning about the impressive and ancient hill town of Sutri, noted for its precious archeological finds covering the Bronze, Etruscan, Roman and Middle Ages. Tom packs his posts with lots of information and history, punctuated with beautiful photographs. I love Italy, and have very fond memories of visits there, so The Palladian Traveler is somewhere I enjoy lingering for a while. Why not pop over there right away, and say HELLO? ** If you want a recipe with a Spanish twist, Tanya at Chica Andaluza is your girl! Her recipes are always easy to follow and I especially loved her Lamb Shanks with Borlotti Beans – the most delicious comfort food you could imagine! You are sure to find something on her blog to tickle your taste buds. Tanya is a passionate cook, aspiring writer and City Slicka turned Spanish Chica who shares the highs and lows of what she gets up to in her Andalucián mountain hideaway. So that´s the CBBH Photo Challenge for January, folks! Remember, all you have to do is post your entry by the end of the month, link back to this blog and, most importantly, don´t forget to share links to any two blogs that you´ve commented on during the past month, so that we can all HOP OVER and have a look. Make sure you FOLLOW THIS BLOG so you don´t miss next month´s exciting challenge! This entry was tagged Andalucía, CBBH Photo Challenge, East of Malaga, Europe, Malaga, photography, Sunday Post, travel, Travel theme, Weekly Photo challenge. Bookmark the permalink. My contribution is here http://gertygiggles.wordpress.com/2013/01/26/cbbh-photo-challenge-reflections/. Hope you think they do your challenge justice. I do indeed – what a fantastic reflective post, Gerty! The reflection of the trees in the pool is beautiful. I love them all. I’ve been able to get something together for your CBBH. I wish I could do everyone’s challenges. It can get overwhelming but I wanted to do one this month for you. Hope you enjoy. Glad you could join us this month, Isadora. Amazing reflections, Marianne! Love the museum shot, wow! So beautiful, it is indeed from a master’s eyes and heart. I can’t Imagine a how beautiful it is . the people and places. what a life! Hi Marianne, I posted a reflections blog recently here https://travelsandtrifles.wordpress.com/2012/12/03/weekly-photo-challenge-reflections-jakes-printer-peaceful/ so I don’t want to repeat. But it was a personal favorite so I though I’d add it to the list. Thanks! Beautiful photos, Tina – thanks for adding them to the CBBH Challenge. Oh how I love those balls Marianne. Hoping that your travels are going well. OH gorgeous shots, Jo – what a clever girl you are! I’m hoping to pick up lots of photography tips when we get to meet up in February. Love the two links you have shared – I’m now following them both – thank you! More likely to be the other way around. Great entry Toby – love the way you have set out your gallery of beautiful reflections. Reflection in Chicago… http://megtraveling.com/2013/01/09/cbbh-photo-challenge-reflection/ Happy New Year! All the best for 2013, Meg. Happy travels! Hi Marianne, thanks for stopping by my blog today and thank you Meg for your mention. Looking forward to next month challenge! Loved reflecting on your photos – beautiful. Lovely shots – well done! Do you have any links to blogs you enjoy visiting, to share with us? Yes…I’ll add the links tomorrow. thank you. AAwwww thank you so much, Tamara. It’s so kind of you to think of me 🙂 I’m honoured! Thanks for your very kind comments. Your photography is amazing and I’m delighted that you are going to be dropping by. Of course, I found you through your site being shared as a link on my CBBH challenge. I’ve only been blogging since August 2012 so that’s how I find new blogs as well. Welcome aboard. Stunning, stunning photos as always. You are an inspiration! Oh yeah, Tom, aka The Palladian Traveler, is such an excellent blogger. I was soooooo looking forward to seeing this building, and I wasn’t disappointed – it’s AMAZING! Thanks for sharing links to two new-to-me blogs! No wonder you are pleased with your photos – they’re wonderful, Gilly. Mobile cameras have really come along in leaps and bounds over recent years, haven’t they? Thanks for the introduction to two blogs, both of which are new to me. I really enjoyed spending time reading both of them. It’s been an exciting month for new blog shares up to now! A stunning collection, as always, Marianne – and a good choice for this month’s theme (with just enough room to wriggle out of the obvious if I can swing a twist!). Hope you’ve left Oz by now and are in the more temperate climes of New Zealand – it looks like a version of the inferno over the south-eastern half of the continent today with even Tasmania in the grips of the year’s first heatwave. We are in Christchurch, New Zealand right now, moving up to the north of the South Island at the weekend. The vineyards of Blenheim and Nelson are calling! How exciting to be able to share two bloggers, both of whom are new to me, at least. I so love to find new places to hang out! Great entry for this month’s CBBH Challenge – well done! Thanks so much dear – it was as if the shot were tailor-made for the prompt while giving me an excuse to begin posting some of my Christmas in the City shots. Hope you enjoy the ‘new’ blogs! A well celebrated year with so many adventures. Happy New Year. Wishing you and your family an amazing 2013 full of joy, peace, love and excitement. Thank you so much for your kind wishes, IT. May all your dreams and wishes have wings for 2013. The Guggenheim Museum in Bilbao is one of my favourite buildings in the world! Your picture of the exterior of the Guggenheim Museum is gorgeous – such interesting lines and shapes! Here’s wishing you a very happy 2013, Marianne! Hope 2013 is everything you want it to be, Sally. I’ll look forward to the post, Marianne. I would love to see more of the Guggenheim. Have a wonderful 2013! Happy new year, Marianne 🙂 What are the celebrations like over there? OH, much the same as anywhere else – parties, get-togethers and fireworks! Hello again Marianne. I wasn’t planning on posting anything today, but you have inspired me, woman :). This post is special to me as are the bloggers I mentioned. Glad to have inspired you on New Year’s Day, Paula. 🙂 And, you have inspired me with your truly amazing reflection, too. I’ve just visited and commented on your two featured links. Thank you for sharing them with us. OH – so do I! A lovely challenge and what beautiful photographs to inspire us. I’ll have to think long and hard about reflections but then you do give us a whole month to sort out our contributions. Must say that your challenge is certainly my most favourite of all the challenges around at this moment. Happy New Year Marianne. All the very best of everything to you for 2013. All the best of you in 2013, Dallas – it’s going to be such a great year for you – I just KNOW it! Happy New Year, Marianne! What an appropriate topic for this month’s photo challenge. My first reflection as I leave my comment is to say how delighted I am that I discovered your blog … through your fab photos, of course … and to thank you for so many other great blogs you have brought into my life. Your photo challenge is a fine idea and a great conduit for connection for all of us in the blogosphere. May 2013 bring you the best of all you wish for! Thank you for your lovely words, Patricia. I always love to discover links to new blogs – particularly ones featured on other blogs in my Reader. Besides, we all love the connection and exposure, don’t we? Marianne – Thanks so very much for picking me out of the crowd and highlighting The Palladian Traveler. I’ll do my best to “reflect” before the end of the month. Happy New Year to you and yours just east of Malaga. You are more than welcome. Your blog is very worthy of being picked out from the crowd, Tom! Good pictures – reflections is one of my favourite photo projects! I like the idea of REFLECTION as a theme, too. All the best for 2013. I’m hoping to make it this month! Look forward to that, Gilly. Go pick a favourite out of those, Marianne! Almost impossible, though the Guggenheim shot is spectacular, and I’m so jealous of your swimming pool. I’m reflecting. I’m reflecting! It’s another(!) beautiful morning here in the UK. Let’s make it a good year. Such a lovely collection of photos, Marianne, each a fitting response to the challenge. That pagoda and it’s reflection is just stunning! Thanks John. Hope it’s given you pause for reflection. WOW- pic #1 is fantastic. Thanks for 2012 and HAPPY NEW YEAR!! !